Following Alice Neel, the Fondation Vincent van Gogh Arles brings to the space the British artist Paul Nash (1889-1946), a major painter of the 20th century still under-recognized in France, whose works selected for this exhibition are imbued with a surrealist atmosphere and a sense of the finite, against a backdrop of death and war. An English modernist, Paul Nash (1889-1946) combined a fascination for natural landscapes with his very personal vision of the real and imaginary worlds which surrounded him. This led him to create an extraordinary body of work, which sets him among the most important British artists of the 20th century. 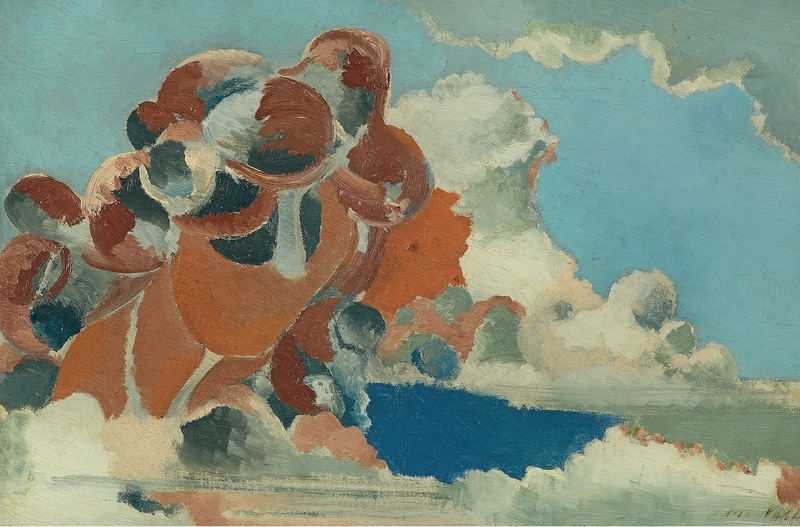 Centred around Paul Nash’s unique perspective – inspired by nature, transformed by the two world wars he lived through and influenced by an increasing awareness of his mortality – this exhibition on the second floor of the Fondation will feature over thirty works painted during the period from 1918 to 1946. Paul Nash’s work bears the influence of a multidisciplinary approach, as well as the artist’s interest in a wide range of subjects, from Christian Science to hot air ballooning, and the mystic poets through to archaeology, photography and design. Presented in reverse chronological order, the exhibition begins with an impressive series of paintings made by Paul Nash during the final years of his life: the visual explosions of Sunflower & Sun (1942). 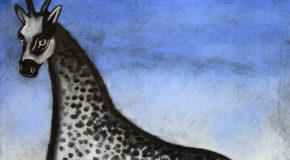 Included will also be a series of landscapes and skyscapes painted in the Surrealist style, as well as his precocious melancholic landscapes created in the 1920s as a response to the First World War. The exhibition will also feature other documents, including photographs and archives, which will shed light on a little-known aspect of this artist’s life and work, that being the influence of the South of France and French painters (such as Paul Cézanne and Jean Lurçat), gleaned during Nash’s various journeys to France in the 1920s and 1930s, including a short stay in Arles. Born in London in 1889 and dying in Boscombe, United Kingdom, in 1946, Paul Nash was raised in Buckinghamshire, where he developed a keen love of landscapes. After failing his naval entrance examination, he chose to become an artist and focussed on landscape painting at the Slade School of Art. He enlisted in the army at the beginning of the First World War but, having been sent to a relatively quiet front in Belgium, he was able to continue painting and became an official war painter in 1917. After the war he suffered post-traumatic stress and produced a number of melancholic landscapes. During his time spent in the south of France in the 1920s and 1930s, he encountered the painting of Paul Cézanne and Jean Lurçat, and then in Paris would discover Modernism, after which he became a champion of the European avant-garde in England. At the beginning of the Second World War, he was once again appointed an official war artist. He died at the end of the war, succumbing to asthma. Paul Nash, Cumulus Head, 1944. Oil on canvas, 41 × 61 cm. Private Collection. 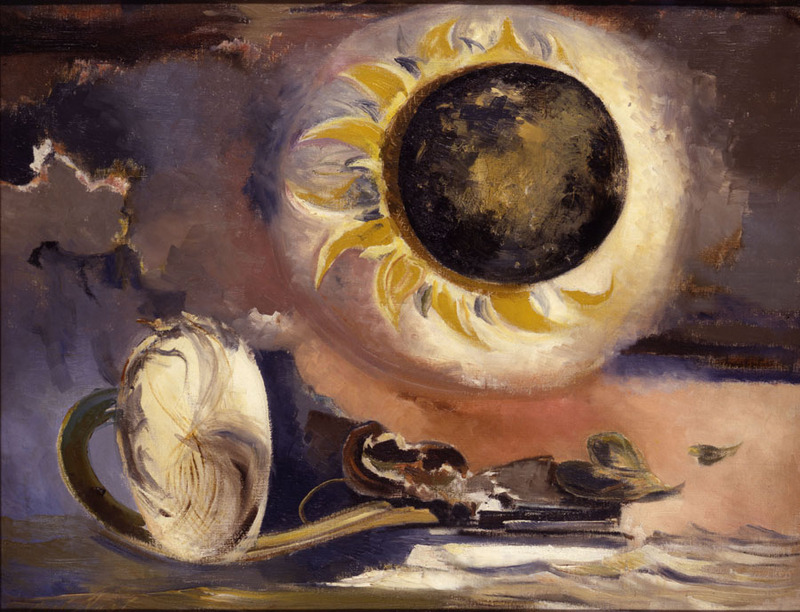 Paul Nash, Eclipse of the Sunflower, 1945. Oil on canvas, 71.1 × 91.4 cm. British Council Collection. Paul Nash, Circle of the Monoliths, ca. 1937–1938. Oil on canvas, 71 × 92 cm. Private collection.